Sometimes the old ways really are the best ways! 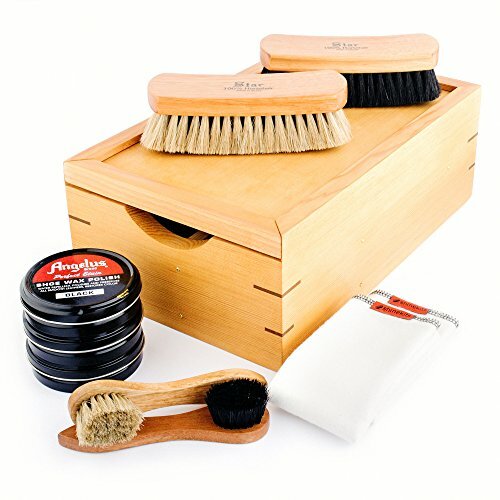 Our Ultimate Shoe Shine Kit will bring you back to an era when men recognized the value in having things of quality and took the time and care to make those things last. This kit has everything you need to ensure years of service from your footware. Each item was carefully sourced to be the best of class. The Box: Keep all the tools for the job close at hand in a beautiful box crafted from Vancouver Island grown Douglas Fir, made in Oregon. This is something you'll want your own kids to have one day. Comes in a rich, honey colored stain with a waxed finish. A magnetic clasp keeps the lid shut tight. There's even a hidden compartment under the applicator brushes. The Polish: Angelus Shoe Wax still uses the original formula created in 1907. A blend of pure carnauba wax, beeswax and the finest grades of other waxes and essential oils. We tested a lot of polishes and this stuff is the best. The Brushes: Horsehair gets the job done right. The fibers clean and polish the leather. Our brushes are 100% Brazilian horsehair and hardwood. The Buffing Cloth: The finishing touch. Our own handmade shoe shine cloths. High quality flannel reinforced with distinctive black stitching. The final step to make that favorite pair of shoes look like new again.